On April 13, a new record was set for the world’s biggest plane. The Stratolaunch aircraft completed its first flight, debuting a unique style of aircraft to the skies that could change the way we travel by air. 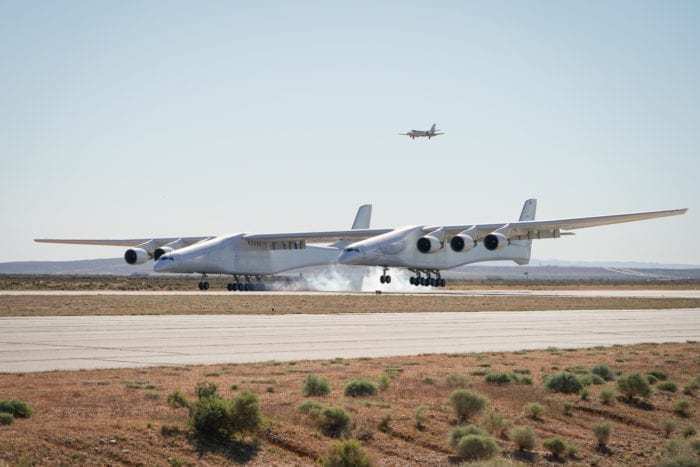 The record-breaking Stratolaunch aircraft completed its first successful flight in the Mojave Desert. Photo: Stratolaunch. The inaugural flight for the Stratolaunch successfully tested the plane with a series of performance evaluations in the air. The aircraft takeoff was early Saturday morning at the Mojave Air and Space Port in California. It flew for a total of 2.5-hours over the Mojave Desert before landing safely back at the port. 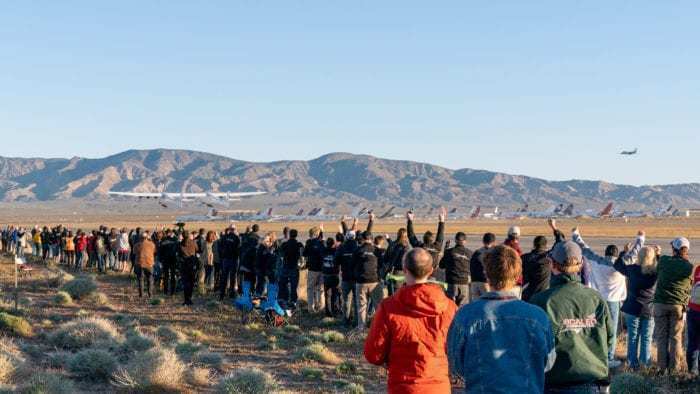 The event was supported by the Stratolaunch team, who were present on the ground to celebrate the aircraft’s first flight. 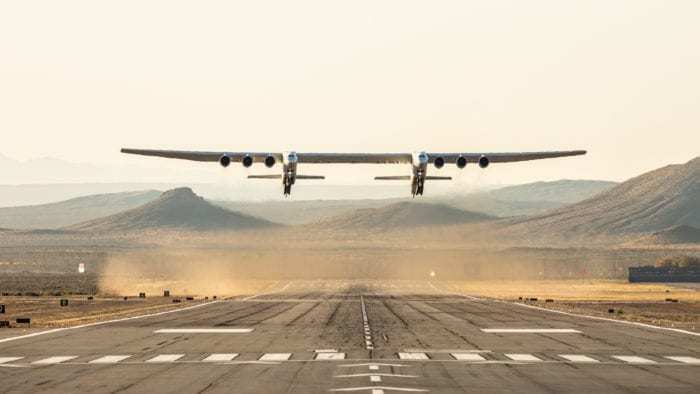 The Stratolaunch flew at an altitude of 17,000 feet over the desert, reaching its maximum speed of 189 miles-per-hour. While in-flight, several tests were conducted to evaluate the aircraft’s flight control systems and to test its handling. It successfully navigated through a long list of maneuvers such as roll doublets, yawing maneuvers, steady heading side slips and simulated landing approaches. The record-breaking aircraft is a sight to see; very different to a typical passenger aircraft. The Stratolaunch aircraft is the largest all-composite aircraft in the world, and features a dual fuselage design. The massive wingspan stretches over 90-meters long, making it longer than a football field. It’s designed with a reinforced center wing to support multiple launch vehicles with a weight up to 500,000 pounds. Stratolaunch aircraft completed several performance tests and maneuvers before successfully landing. Photo: Stratolaunch. The Stratolaunch aircraft is a mobile launch platform to revolutionize air travel. It could potentially enable airline-style access to space flight, making the journey both routine and affordable for everyday passengers. The success of the Stratolaunch test serves to continue progress towards the ultimate goals of the project. The aircraft is a product of Stratolaunch Systems Corporation, founded by Paul G. Allen in 2011. The mission of the company is to protect and preserve the Earth for the future. It hopes to accomplish this task by enabling problem-solvers easier access to space, so that they can conduct research and collect data. It’s expected that valuable data could be used for initiatives and advancements in the fields of science, research, and space technology. The first step to achieving the lofty goal is to provide a method of transportation that’s convenient for traveling to and from space. The Stratolaunch test flight shows positive signs for the company to be able to offer a solution to society. It provides insight that the company is on-track to accomplishing space flight using a revolutionary aircraft. The Stratolaunch team celebrates as the world’s largest aircraft takes flight. Photo: Stratolaunch. We’re seeing many tech billionaires take on the mission of space exploration, including SpaceX by Elon Musk. As Microsoft’s co-founder, the late Paul G. Allen has his legacy well preserved with progress for Stratolaunch, and this successful flight will no doubt be the first of many for the progressive aircraft company.